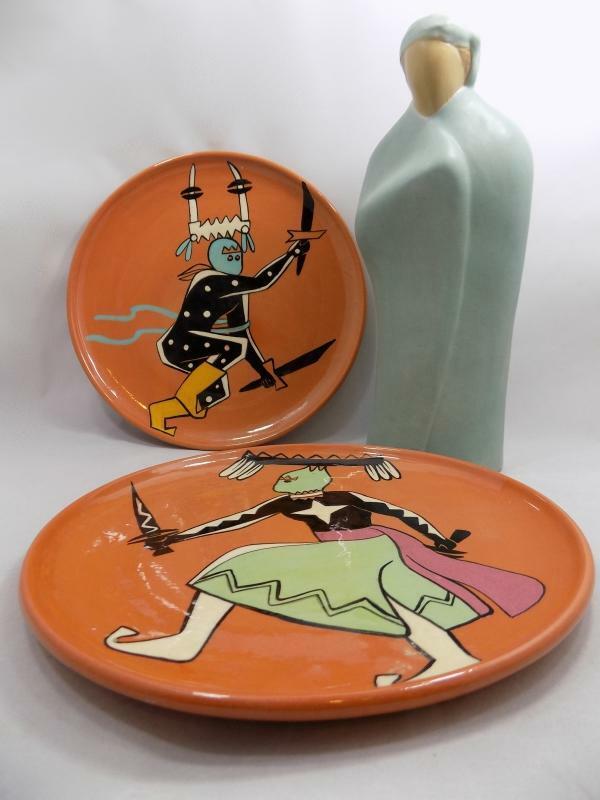 This fabulous pair of 10 inch ceramic plates were made in the 1950's by Kay Mallek. 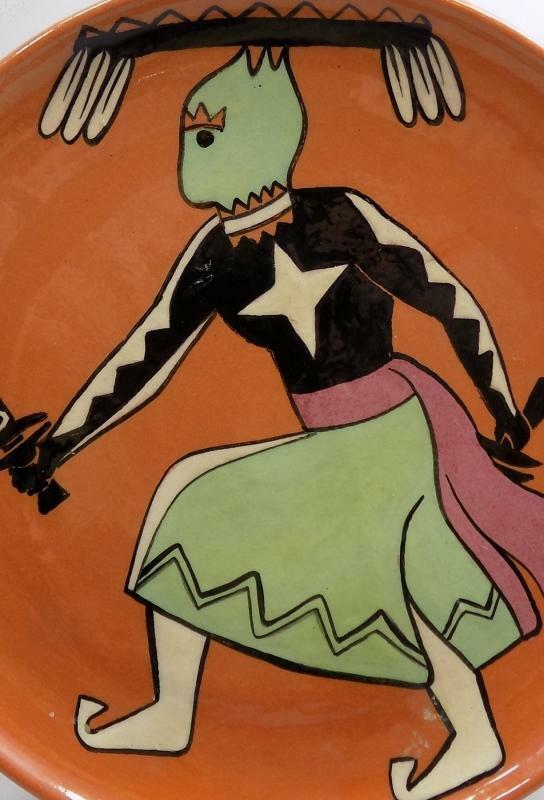 In addition to owning one of the more upscale antiques shops for many years in Tucson, she was a renowned ceramicist and artist. Born on a farm in Illinois in 1912, she studied art at the University of Arizona. There are tile murals in many places in Tucson painted by her and signed "Kay Mallek Studios." such as the three she did in 1961 for a Tucson bowling alley. Several private homes in the area feature her hand painted tiles and are a point of pride for the owners. 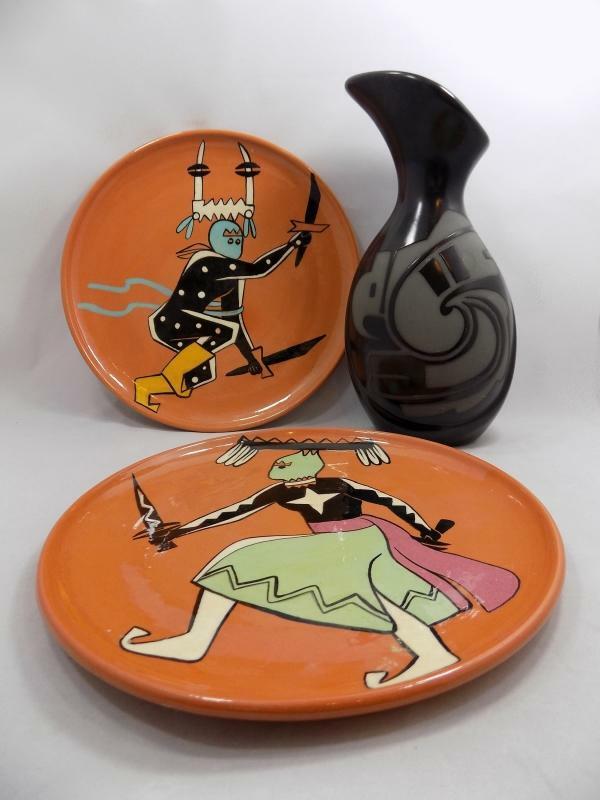 Her later ceramics in the 1970's were commercially produced limited edition collector plates. She passed away in December, 2001. 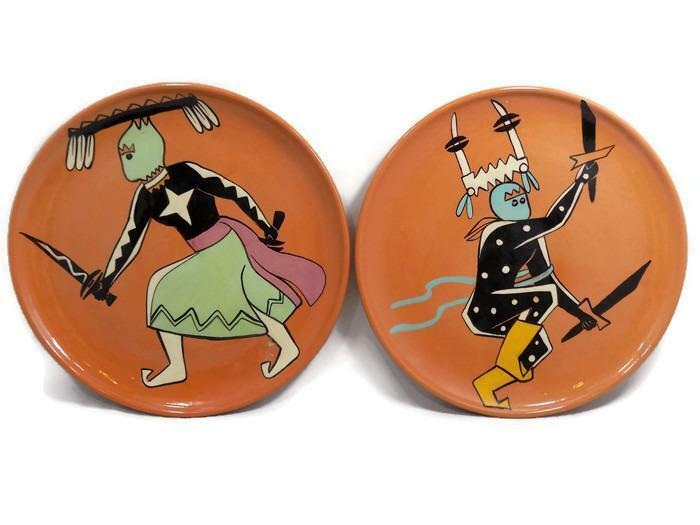 These large plates were glazed in an adobe color and decorated in Mallek's artwork depicting stylized Apache clown dancers in their traditional costumes. For the Apache people, clowns are considered to have the ability to heal and protect from disease. 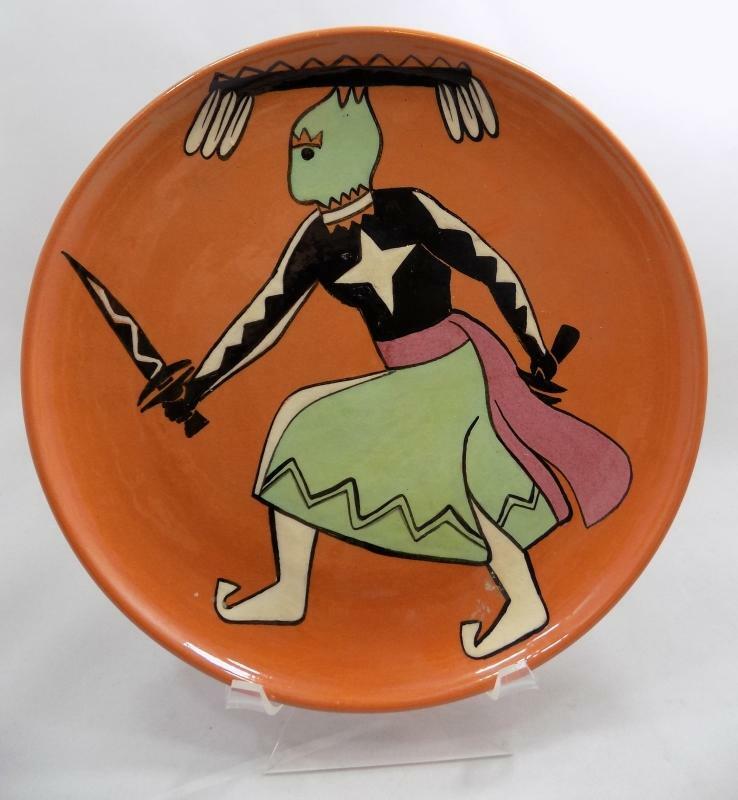 In the early 1900's, the Unites States government banned these Native American ceremonial dances, so the beautiful artwork on these plates are in a way a memorial to those rituals. The plates are dished, with a definite rim and stand about 1 inch high. They each weigh 1 1/4 pounds and are in excellent condition, no chips or cracks and the colors bright and fresh. 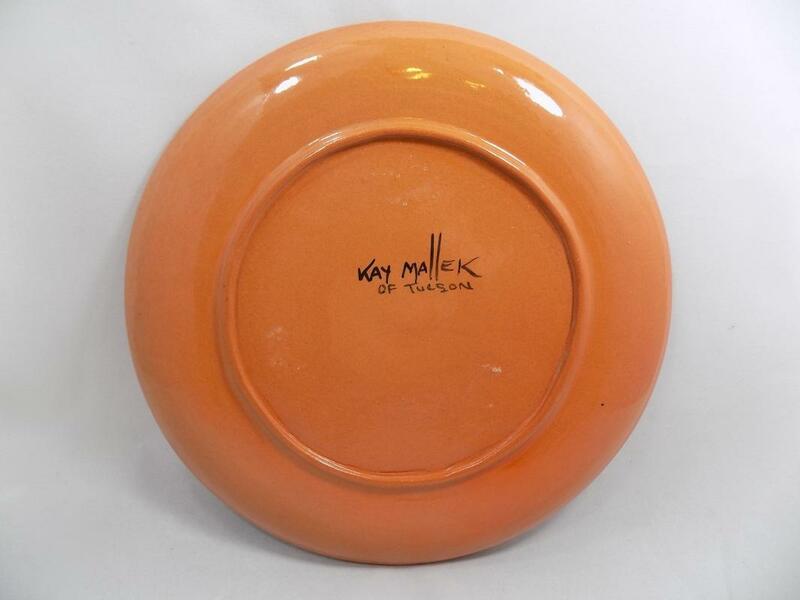 There a few minor signs of wear (be sure to zoom the photos) but they appear to have been treated carefully over the 60 years since Kay Mallek created them. 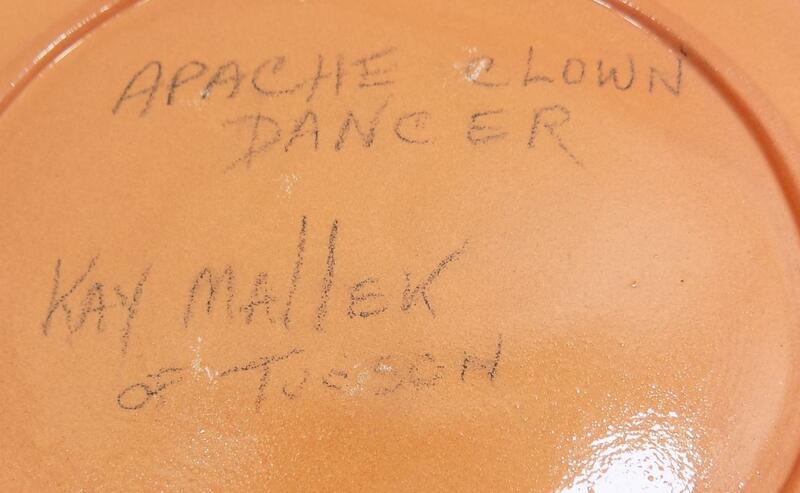 One of the plates is signed on the back:" APACHE CLOWN DANCER KAY MALLEK OF TUCSON" and the other one "Kay Mallek of Tucson," both printed by hand in black. 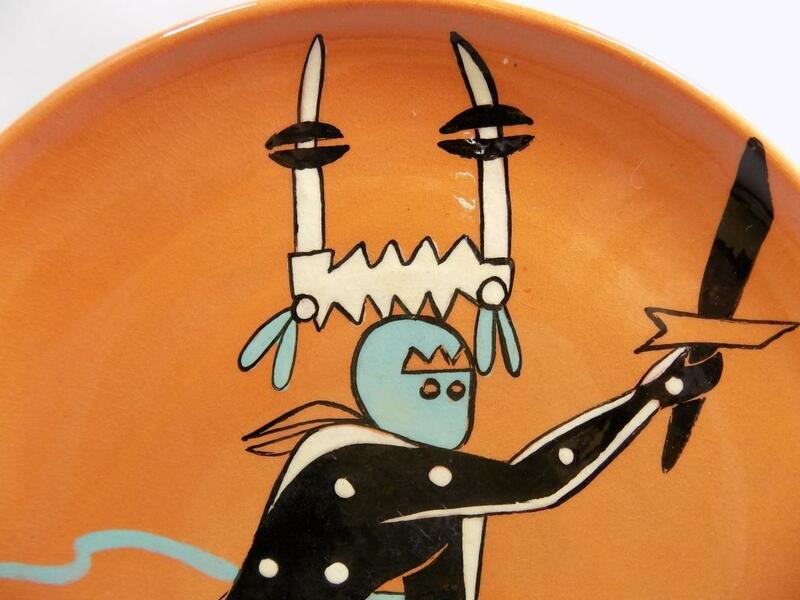 Whether you lean toward Southwest or modern décors, or collect spectacular ceramics, these plates are perfect for you. The blackware pottery vase shown in our photo, also from Arizona, has been sold.